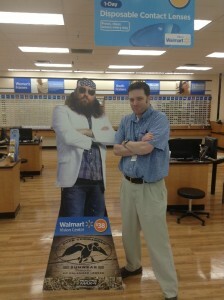 Our Walmart Vision Center has a life-size poster of a tough-looking beared guy from Duck Dynasty. Someone thought it would be fun to put a Walmart name tag with the name “Willie” on it. It’s strange having Willie in the optical because you see him out of the corner of your eye and you instinctively have to look over at him to see who’s there, but the then you feel stupid because you’ve already told yourself a thousand times before that Willie is just a cardboard picture. The other day, an optician saw a lady trying to talk to Willie and asking a question. Of course it was only for a few seconds, but it was a couple seconds longer than most people would talk to a cardboard picture. The VC manager decided to take the name badge of Willie after that. Now most people just come over and have a picture taken with cardboard Willie. David Langford, O.D. on March 17th, 2010 under Optoblog • Comments Off on Your TruFocals Have Arrived! 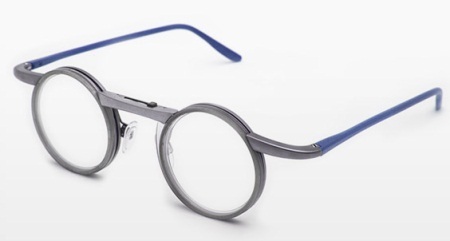 Trufocals have arrived! Now all you have to do is adjust a slider to focus from near to intermediate to distance. Sphere powers are from +6 to -11, cyl up to -3.50, any axis, up to 3 p.d. prism horizontal and vertical per lens, add up to +3.00, and p.d. from 50 to 70 mm. As soon as I have a spare $900 I’ll have to get me a pair. Clear vision isn't all it's cracked up to be. 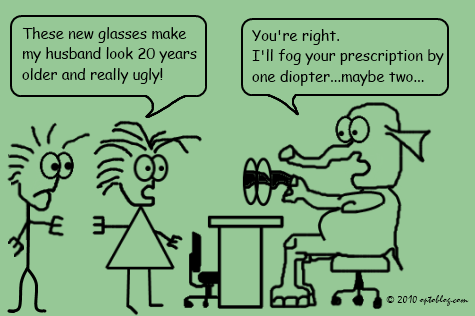 It’s the return of the Optoblog comics! Comics are by far the most searched for items on my blog, so I’m just bowing to demand. I once heard this from a rep, and this cartoon was immediately spawned in my brain. And I know that women don’t normally buy the engagement ring, and yes, I just use the same pictures and change the words. 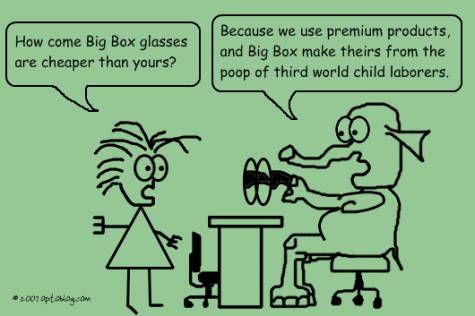 This is what I wish I could say to patients when they ask about private practice glasses prices. Do you ever feel like we’re being sold out by the very lens companies that say they’re looking out for us? 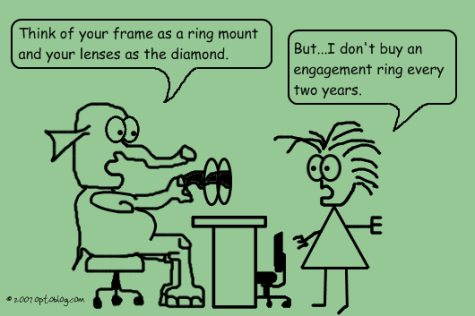 For example, Wal-Mart sells lenses for cheaper than I can buy them from my lab. How does that happen? What if a whole bunch of private practices started a co-op lab so that all profits from the lab go to the doctors? Or is Red Tray Optical the answer? I like the consignment deal that VSP offers with their line of glasses. Why should I have to pay for frames that haven’t sold? Since frames now days look so freaking wacked, I think all frame vendors should work on consignment. All I know is that doctors seem to be getting the short end of the stick while the frame and lens makers are assured their cash. I don’t see a profit motive for Big Lenses to help out private practice docs since commercial makes them more money overall.